“Breathe Me” by Sia, Journey’s “Don’t Stop Believin'” and “Before the Devil Knows Your Dead” by Delta Spirit are three songs that accompanied the final moments of season finales that I hold in high regard. * The last episode can be controversial and divisive (see Lost and The Sopranos), all round hated (the Dexter swansong) or generally satisfying (Friday Night Lights, 30 Rock). 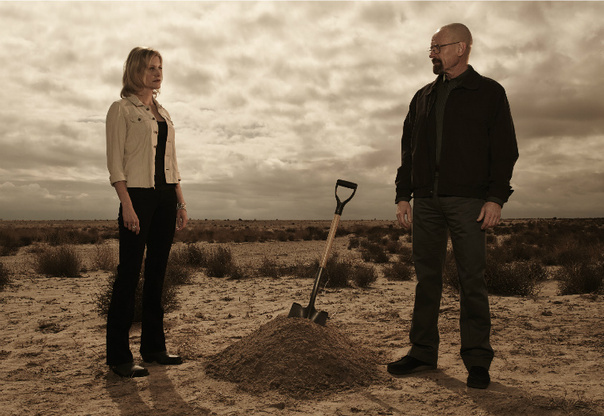 As Julie Hammerle points out in her excellent Breaking Bad review the last outing is rarely the best episode of the show and Breaking Bad creator Vince Gilligan even stated that the penultimate penultimate episode “Ozymandias” is the best hour of this show. For me Breaking Bad falls into the generally satisfying category and yes the story was wrapped up neatly, but it felt fitting to what we have been watching; a show that has been chaotic and reckless, but has always had a strong structure much like the crystal meth that Walt has been making. The closing song choice as Walt lays down to die surrounded by meth equipment similar to what allowed to be a king is Badfinger’s “Baby Blue” a song which starts with the line “I guess I got what I deserved.” While this notion might be in contention as Walt got to die pretty much on his terms and as he told Hank he would die before he was convicted – from a gunshot and not the cancer as he predicted. 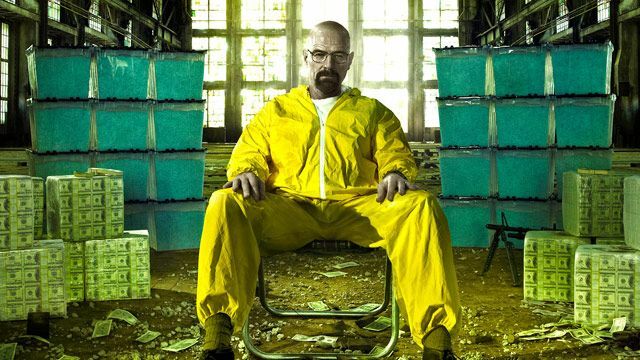 The song title is also a not so subtle nod to the color of the meth that made Walt so famous and as he lays dying in a lab it is pretty fitting. What a final song choice needs as we witness the last few minutes of a character, that we have not only watched but discussed for hours is some sort of finality and while something like The Sopranos refused to give that with its closing scene (a scene which I love) the end of Breaking Bad is not ambiguous in any way. Walt’s story is over and while characters like Jesse will be haunted by what has happened in the unseen hours of the show (fanfic time!) our protagonists tale is over. This neatness is not the ending that all will find satisfying but on this occasion I’m more than happy with the end result. 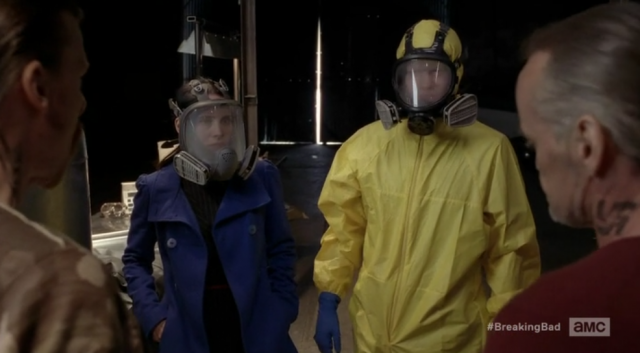 Breaking Bad isn’t a show that I turn to for fashion ideas; a yellow hazmat suit is hard to pull off in everyday life. This isn’t to say that costuming and the colors these characters wear isn’t important and something like the Heisenberg pork pie hat is an integral part of the Heisenberg/Walter White persona divide. A few weeks ago I wrote about Lydia’s blue coat and Lydia’s wardrobe is the most high-end of these characters. No one would suspect that a woman who dresses in designer labels is part of a global crystal meth operation – the same can be said for Walt and his unassuming look. Lydia always looks incredibly out of place when she has to deal with the folks who are running the ground operation and her skittishness adds to this vulnerability. This was abundantly clear when she used Uncle Jack and his crew to dispatch the substandard meth making team she had employed since Walt has retired. Fancy office wear is not really appropriate for the desert, drug related massacres or meth labs. Lydia’s appearance could be one of the reasons why Todd is so drawn to her; she looks nothing like the people he is used to dealing with and so far we have seen him act protectively towards her. Jesse Plemons spoke to Vulture about Todd’s Lydia attraction and he thinks that Todd “might have some mom issues. It makes sense. She needs him and he’s misinterpreting that a little bit.” This is the polite way of saying that Todd is developing a Lydia obsession and I wouldn’t want to be the person to get in the way of Todd and his crush. When Todd met up with Lydia in the most recent episode he ditched the scruffy look and went for a smart pale button-down shirt – nothing says I love you like a clean, ironed shirt. This is his way of signalling to her that he can help run a successful venture and he’s essentially wearing his best clothes to impress her and mirror what she wears. It also helps reinforce the success that Todd has had with manufacturing meth that is of Heisenberg quality and color. 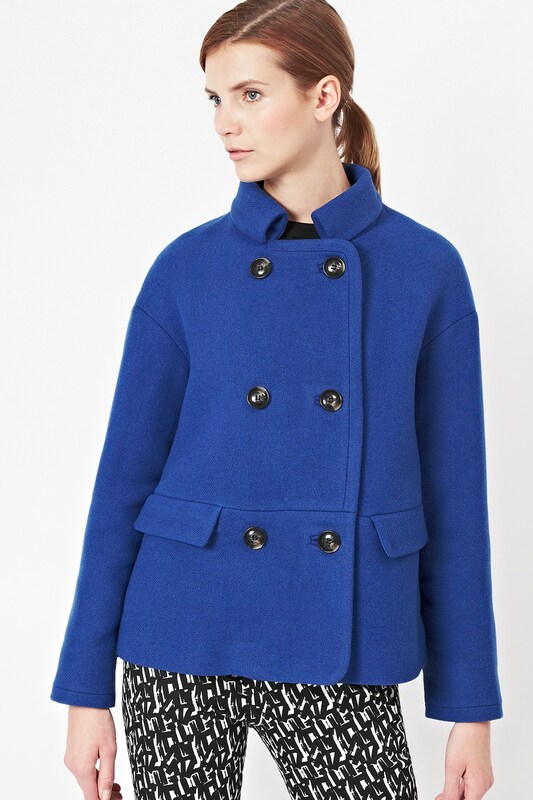 Back to the blue coat in the photo above and I have found a similar looking cobalt blue double breasted wool coat from French Connection in their A/W ’13 collection. While the collar detail is different and Lydia wouldn’t wear those pants, it’s definitely a near match. We’re about to enter coat season and between this and Olivia Pope’s Burberry trench I’m getting a lot of ideas. There are just two episodes left of Breaking Bad and AMC has released a poster that celebrates both the show and the fans. 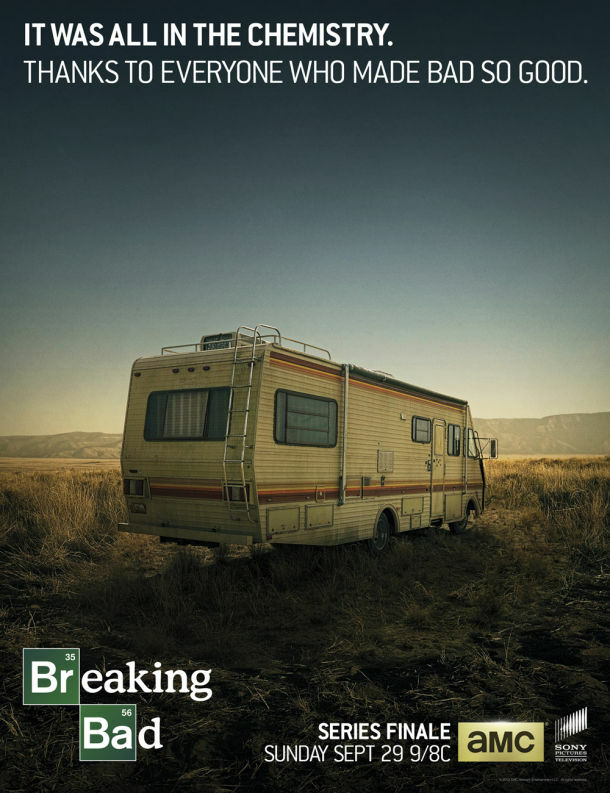 The image is a simple one of where it all started; we got to see the RV once again in the last episode as part of a flashback that showed Walt’s first meth related lie to Skyler. A lot has happened since then and the second part of season 5 has been firing on all cylinders; I watched “Ozymandias” a few days ago and it’s left a big impression. If babies could get nominated for things then the kid(s) playing baby Holly deserves something for “Mama” improv and for breaking my already smooshed heart in the fire truck at the end of the episode. AMC has also announced that the last two installments will be slightly longer than normal and will run at 75-minutes with commercials; plan for extra snacks/drinks (the latter will definitely be needed) because the tension is sure to be high. The last episode airs on AMC Sunday, September 29 (good luck all other shows that are premiering that night) and will be available on Netflix on Monday 30 in the UK. Late night TV has had a good week with the reveal that Jimmy Kimmel was behind the Worst Twerk Fail video, but we have a new rival for best moment as Late Night with Jimmy Fallon unveils their Breaking Bad parody “Joking Bad.” As with the previous parodies like “6-bee” (a take on Glee featuring the Parks and Recreation cast) and “Downton Sixbey” it is essentially a love letter to a show that is dominating the conversation. Jimmy Fallon is pretty spot on with his Walter White’s mannerisms, particularly the hunched posture when he is on the phone. There are also nods to the meth making montages, the roof pizza and how they like to stick the camera on random objects. Cameos from Bryan Cranston, Aaron Paul and Bob Odenkirk, and a twist at the end make this a very fun piece from the Late Night crew. Breaking Bad is back for the final 8 episodes and once again they brought their A game from the pacing to Aaron Paul’s perfect glassy eyed stare that has the ability to tear through my soul. While I’m not going to go into too much plot detail with this Music Monday post I will say that Hank is ON IT and the choice of song that accompanied the montage of Hank looking through the evidence is brilliantly chaotic. Jim White’s “Wordmule” follows Hank on this journey of realization as he pieces together what he knows to be true, but can’t quite fathom the reality of who Heisenberg really is. Breaking Bad Season 5 Photos: New Alliances? 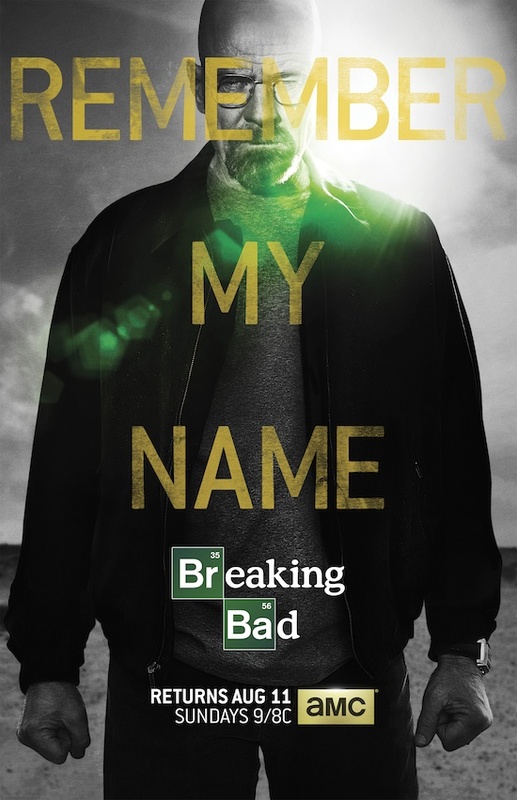 There is less than a month to go until the final 8 episodes of Breaking Bad and AMC has released another batch of promo photos; first they reminded us that “All Bad Things Must Come to an End” followed by the recent shot of Walt looking menacing with the words “Remember My Name” emblazoned across his figure. The teasers have done a great job of well, teasing by telling us the show is ending, a fact I was trying to ignore and telling us that Walter White means business (or wants to join a Fame revival). It’s time to see the rest of the cast and theorize about what these pairings could mean for the end of this journey. The partnership that started it all has been through its fair share of triumphs, disasters and deception. The last episode saw a petrified Jesse receiving a bag full of money from Walt and their relationship has been severed in what appears to be an amicable fashion (at least a lot more amicable than it was for Mike). That isn’t to say that Jesse isn’t broken by his experience with his former chemistry teacher or that he won’t get sucked back into the business once again. 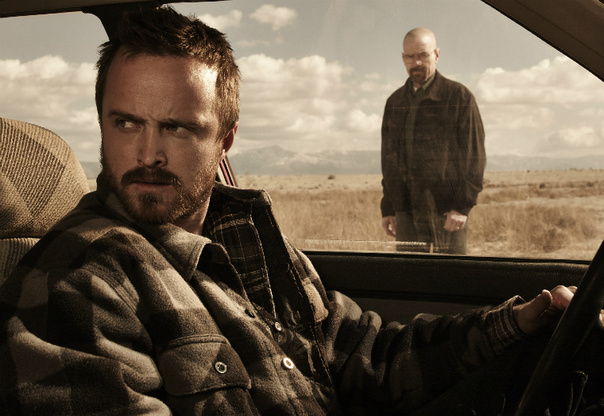 Jesse is the heart of Breaking Bad and so it has become increasingly difficult watching him get torn apart by the things he has done and if he does manage to break free from Walt he will always be looking over his shoulder as the shot above suggests. Nothing would make me happier if Jesse gets to drive away from all of this. The episode that ended the first half of this final season had Hank finding out that Walter White is really Heisenberg (his discovery was made in the most innocuous place – the bathroom, thanks to Walt’s toilet reading material) and so it’s not outside the realm of possibility that Hank will attempt to team up with Jesse to bring Walt down. There is bad blood between Hank and Jesse as Hank beat the living crap out of Jesse back in season 3. This led to one of the many amazing Aaron Paul moments as he delivered a speech full of hate about Hank from his hospital bed. Will they be able to put this behind them? This photo has them both looking at each other with suspicion, with Jesse looking over his shoulder once again and if they do work together trust will be an issue. I’d really like to see a happy ending for both Jesse and Hank, but knowing this show and how far Walt is willing to go I fear that one of them won’t make it to the end of the show alive. A note on Jesse’s wardrobe; gone are the hoodies and this look is more adult than we have seen before, the double plaid works together and his appearance is more rugged. This weathered look reflects the toll that his time with Walt has had on him both mentally and physically. 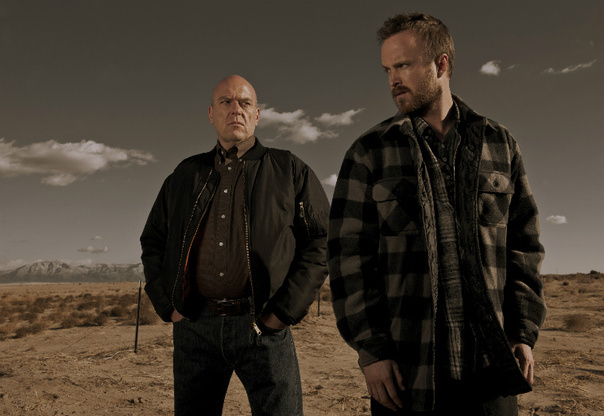 Jesse isn’t the only one who has been broken by his relationship with Walt as Walt’s family has been destroyed by his work in the crystal meth business. While Walt Jr. and Holly have been shielded from this to some extent, Skyler has not been so fortunate. After becoming involved in the money laundering side Skyler has become a shell of her former self and suffered a breakdown. Skyler did manage to convince Walt to end the business after she took him to a storage unit and showed him how much money he has accumulated and asked him how much their family is worth. That’s the reason Walt started all of this, but because his cancer didn’t kill him like he thought it would he went a lot further than he ever intended. While the family scene at the end of the last episode suggested closure, thanks to the opening scene of season 5 we know that things have escalated and this is probably thanks to Hank’s discovery. What role will Skyler play in all of this? Will she remain the dutiful wife and help Walt bury more secrets as the photo above hints at? Or will she stand tall against the man who is no longer anything like the one she married? Answers will be forthcoming when Breaking Bad returns Sunday, August 11 on AMC. 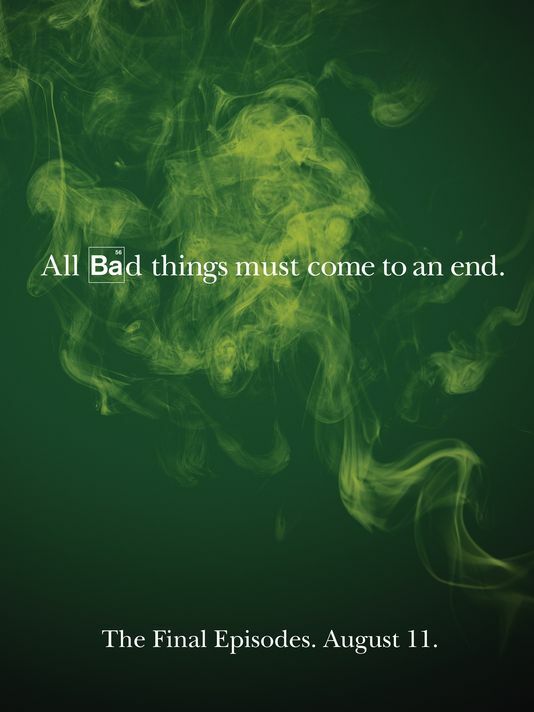 Earlier this month AMC released a teaser poster for the final 8 episodes of Breaking Bad with the ominous tagline “All Bad Things Must Come to an End.” The new key art has a more direct message and features a menacing looking Walter White; he barely resembles the guy in his underwear from the season 1 promo. Looking angry and in control, but it’s his name that could get him into trouble as Hank knows the truth behind Heisenberg. What do you think of the new poster? Worried about the lack of Jesse? Attempting (and failing) to not sing the theme from Fame? Breaking Bad returns to AMC Sunday, August 11. The wait is almost over for the final 8 episodes of Breaking Bad and the first teaser poster has been released; it reveals pretty much nothing, other than it is really the end. Its design is simple and if you’re looking for clues you might have jump down the rabbit hole and enter the Megan Draper is already dead levels of investigation. As this is the first part of the final promotional campaign for Breaking Bad I like the sparseness of this design and the impact comes from the ominous smoke and lack of characters in the image.